Welcome back to another issue of Milk Bar Mornings. To start off Milk Bar Mornings after a short break, we will be looking at the various boss themes from The Wind Waker. 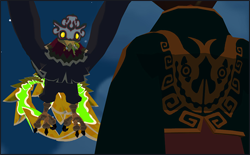 The Wind Waker has an amazing pallet of bosses, from giant birds to hundreds of poes, The Wind Waker‘s boss themes are fast, upbeat, and cinematic. Boss music is an important factor in any game, ensuring that each track fully represents the grandness of both the boss, and the stage that the player went through to get to the boss. We will be looking at how the composers of The Wind Waker have created amazing pieces, through technicalities and story. So hit the jump to see what we have in store! 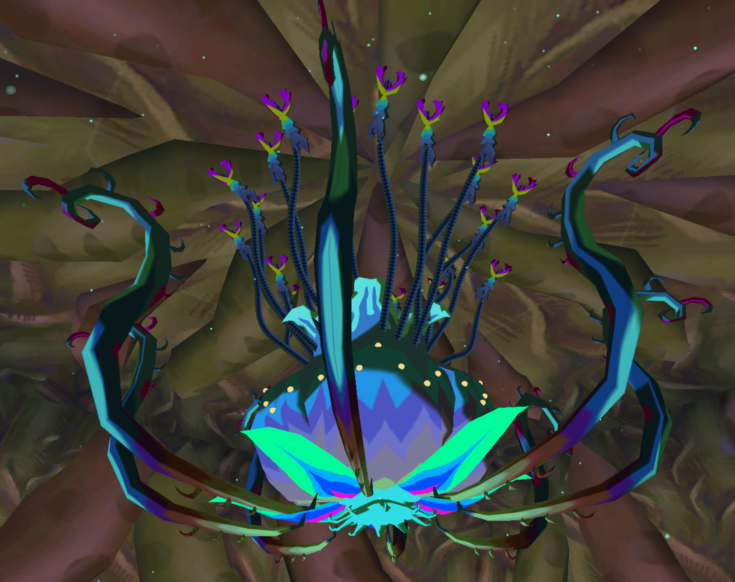 Kalle Demos is the second boss Link encounters in The Wind Waker. Kalle Demos is a large plant creature that Link fights when making his way through the Forbidden Woods. The theme that takes place when fighting Kalle Demos is a simple yet effective song. Various percussion instruments, drums, bells, synths, pipes, horns are played through out the song. The heavy usage of percussion is used to create a childish feeling, something present numerous times through out the series. The story behind this theme is one of abandonment. The Forbidden Woods is a place which as the name suggests, is very rarely entered. Because of this the plants growing inside have gone self-aware, becoming living breathing creatures. The childish feeling heard through out the song creates a creepy tone, yet the quick tempo of the song creates a tone as if the creatures in the woods have gone crazy, and eventually evil. As the woods aged with out any visitors, the creatures realized that no one would venture in there, and simply decided that no one should enter the woods, killing any one who does. 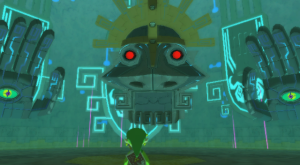 Gohdan is the third boss Link encounters in the game. 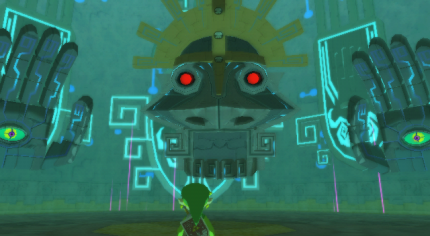 Gohdan is faced in the Tower of Gods, as Links final obstacle to prove he is worthy of being a hero. Gohdan is very different from all the bosses Link encounters, for a simple reason, he is a robot, and his theme does a great job at showing this. The main instrument used in the song is an organ, a very mechanical instrument. The usage of the organ accompanied by a harpsichord, another very mechanical instrument, and of course drums, a very fitting song is created. The story present in this theme is a story of wits. Gohdan is designed to be a test for potential heroes, and one thing a hero must be, is clever. To prove this in a hero, Gohdan must be killed using a variety of weapons, in a variety of stages, rather than simply just being hacked at with a sword. This requires the hero in question to go the extra step and think on a bigger strategy to kill Gohdan, other than to do the common thing which is use a sword. The usage of organ plays an intricate theme, and the harpsichord, a popular historical instrument, creates an intellectual tone. Together, this creates a theme that makes emphasizes that the player doesn’t need to just be good at rolling and hitting the opponents weak spot, but rather take the opponent one step at a time for an effective kill. The Helmaroc King is the fourth boss in the game. Link fights, and defeats the Helmaroc King on his second attempt to save his sister Aryll. The Helmaroc King kidnaps her in the beginning of the game and attempts to capture Tetra, yet fails. He then continues to reside in the Forsaken Fortress until the player defeats him with the help of the newly acquired Skull Hammer. The theme for the Helmaroc King is filled with a full orchestra, contain strings, percussion, brass, and woodwinds, together creating an upbeat battle theme. The theme for this battle is a theme of assurance. When Aryll gets captured Link makes it his goal to save his sister, and when the time finally comes to kill the beast that took her away, thousands of thoughts race through his head. One of them is assurance that he will get through the danger and kill the beast. The song reflects this by having sections that sound hopeful and legato, meanwhile having parts that send a feeling of danger reminding the player that this is still a monster, yet no obstacle that can’t be faced. Together a feeling of assurance knowing that Link will save his sister is sent out, meanwhile still having the grandness of the battle be presented through the full orchestra. Well that is all for this weeks issue of Milk Bar Mornings. Let me know what you thought about this weeks issue, and let me know what you would like next weeks theme to be! You can let me know in the comments below! Thanks for reading.